Once you graduate or resume paying your student loans after a period of forbearance, you may find that your student loan servicer has changed. 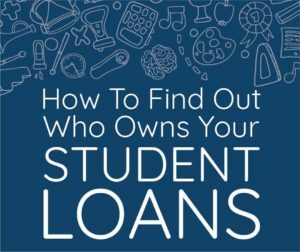 Unfortunately, the task of finding and paying the proper company rests on the borrower, along with other facts you probably didn’t know about your student loans. If you don’t know where to send payment or who to contact for your student loans, you need to figure it out. If you delay, you could miss a payment and see your student loans go into default. 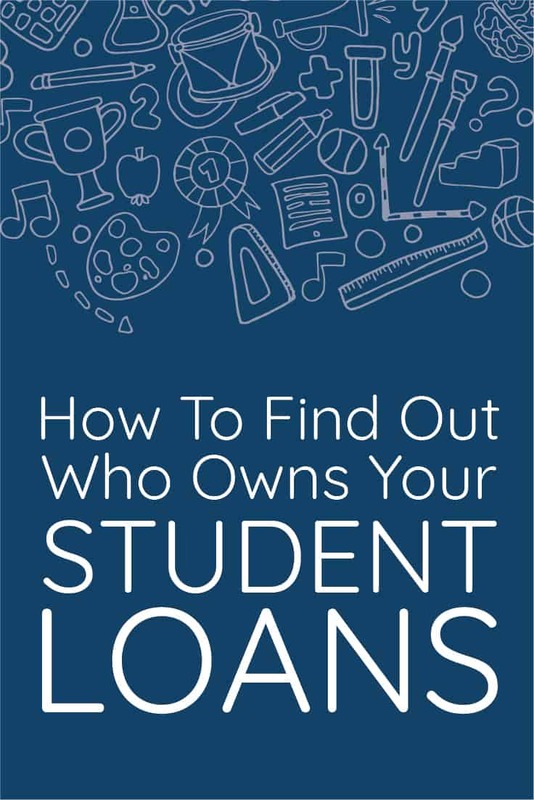 Borrowers need to find out who owns their student loans so they can track student loan balances and make sure the payments are applied correctly (for instance, if you make payments designated towards the principal or interest). A student loan servicer acts as an intermediary between the lender and borrower. Student loan servicers collect payments from borrowers, and also help manage student loan repayment in the event of deferment, forbearance, or other repayment options. Despite whether you find work after you leave school, you need to identify your Federal loan servicer so that you can inform them of your situation and either make payment arrangements or make other plans to ensure that your account remains in good standing. Student loan servicers are assigned to both federal and private loans. The process for finding your loan servicer will be different depending on whether you have federal or private student loans. If you have both, we’ve got you covered in terms of the steps you need to take to find your student loan servicer. Below, we have the exact steps you can take to locate your student loan servicer online. If you don’t know where to begin, start here. Recently, the Federal Student Aid ID replaced the FSA PIN, a four-digit number federal loan borrowers used to use to fill out the FAFSA and log in to other Federal Student Aid websites. The FSA Pin was replaced with a Federal Student Aid ID in 2015, so you will want to create a new FSA ID if you haven’t logged in to a financial aid website in the last 3 years. Not only is the FSA ID a useful tool to view your loan details, you can use it to apply for a direct consolidation loan or an income-driven repayment plan directly through the government. Go to the Federal Student Aid FSA ID page. Create a new FSA ID: The site will prompt you to fill out your email address and choose a username and password, then click continue to proceed with the application after checking the box for age verification. Your FSA ID Must Match Your FAFSA Information: It is important to remember that your FSA ID must exactly match the information on your FAFSA. According to the Federal Student Aid site’s FAQs, common issues with failed log in attempts are often the result of confusion of FSA IDs. Keep Your FSA ID Confidential: It is important for you to keep your FSA ID confidential, just like a pin number for your debit card. Also, avoid sharing your FSA ID with anyone, including relatives and friends, especially if you are sharing a computer. Once you get your account information and create an FSA ID, you can view your loan details on the National Student Loan Data System. Go to NSLDS Student Access and click on “Financial Aid Review.” Enter your FSA ID after you access the site and accept the site’s terms and condition. Next, you will find a page that has a chart labeled ““Aid Summary,” which will list a summary of your loans, including the type of loan, loan disbursal date, and amount due. You will be able to access more information about each of your loans when you click on the boxes to the left of the “Type of Loan” column. At the bottom of the page, you will see a chart labeled “Servicer/Lender/Guaranty Agency/ED Servicer Information.” To the right, you will find the “Current ED servicer”, which is your student loan servicer. Once you have gone through these steps, you will then have to sign up directly with your federal loan servicer to make payments. You can also pay your bill by check, mailing your payment directly to your loan servicer. There are several benefits to signing up for automatic payments from your bank account- you will never miss a payment, so long as there are sufficient funds in your account, but aside from that, there are monetary benefits to automatic payments. You may be eligible for a small interest rate reduction if you decide to pay via direct debit. Once you are registered, you can connect your bank information and make payments directly from your bank account. You can send checks as well, but in my opinion, it’s much easier to do it online. Typically, you can get a 0.25% interest rate deduction by signing up for automatic payments. If you’re not interested in auto pay, find out if you can sign up for online alerts to be reminded when a payment is due. If your student loans are in defaults and in collections, you need to contact the student loan debt collector servicing your loans. Here’s the complete list of debt collectors for student loan debt. Furthermore, you need to take steps to get your student loans out of default through a process called student loan rehabilitation. If you have private student loans, the process may not be as straightforward, and it may take a bit more work to locate your student loan servicer. The best way to find your private student loan servicer is to pull up your credit report. You can check your credit report for free at annualcreditreport.com. You can also use a free tool like Credit Karma to monitor your credit and get help. Once you see your credit report, you can see all your lenders listed. You will also be able to get contact information for these companies, along with your loan balance, account number, and more. With this information, you can start tracking down your student loans. It sounds like it could be confusing, but it doesn’t have to be. You can do most things yourself on StudentLoans.gov. You can also call your lender to get started. What are some of the biggest issues you have had with your student loan servicer? Tell us in the comments section below. I need the name of the owner of my private student loan, not the company that is servicing the loan. I want to reach a settlement and pay loan off, my servicer will not give me that information, claims that they don’t have it. They said to write a letter and that they would forward, it has been more than six months, with many inquiries, but still no information on the servicer. I tried the ombusden’s office for student loans, but they are only federal loans. This seems ridiculous to me, how do I get that information. You need to send a certified letter to your loan servicer, and they will have 30 days to respond. You need to send it certified mail with return receipt so you have proof of when the 30 days starts. As a side note, your lender will likely not settle your private loan unless they have a large incentive to do so (since they can collect on it). If you run into issues, or the 30 days passes, you should contact a student loan lawyer. Thank you for your response, I will start at the certified letter. Someone told me that if I ran a credit check on myself that the lender would pop up, is this true, I hate to run a credit check if not necessary… or would just the servicer pop up? Typically the loan servicer will be on your credit report – and you don’t need to worry about checking your own report. You can do it for free once a year at AnnualCreditReport.com – it takes about 5-10 minutes. You can find all of your info on your SFA login. I realize that this thread is a yr old, but I’m hoping to get a response. I’m in the same position as the person above. I’m wanting the contact information for the bank that actually hold my loan, not the servicer. The servicer Firstmark Services is absolutely terrible. I’ve called numerous times and each time they tell me the name of a different lender, but refuse to give me their information. I finally found out who the holder of my loans is (farmers and merchants) and Firstmark refuses to give me the contact information for the bank. I was under the impression that by law that information was rightly mine. They so no, that they’re not required to give it to me. Help! You need to send a certified letter asking for a copy of the promissory note and contact information for the loan holder. However, if Firstmark is your servicer, you’ll still deal with them. In fact, the loan holder will likely send you right back to Firstmark – they pay them to handle the loans as if they were the loan holder. You don’t get to decide that. What is wrong that you need this information? Maybe there is a better approach. How do you find out if a student loan has been taken out in your name? Easiest way is your credit report – follow the steps in the article. I need to know who actually owns my loan, not the servicer, as I have compliance reporting obligations for my job. What is the best way to find that info (some of my loans don’t have a listed owner on FSA.gov)? Well, all Federal loans after July 1, 2011 are owned by the US Government via the Department of Education. If you have loans prior to that, your loan servicer should be able to tell you. You might be best served sending a certified letter asking for your promissory note, because when you call, realize you’re just talking to a huge call center that probably won’t help. I need to get proof that a loan was paid off through a servicer (ACS) that does not exist anymore!! The loan was paid off and closed with ACS. ACS then became Conduent. No one at Conduent can pull up my information. How could I get this information? Any ideas? Send a certified letter requesting your payoff confirmation. Can you pull your credit report and validate? Are any of the advertised programs of “write off your student loan,” or “getting your student loan dissolved” programs real? Or, is it just another financial institution trying to rewrite your loan? There are so many advertised on social media, and other emails, and I don’t want to begin working with one just to find out it is another company gaining, and adding to my loan. I’ve had a private student loan on default since 2006 when I log in to my credit report the loan doesn’t show up. Where can I find information about it? Your loan may have been written off at this point in time – over 10 years. If you are concerned about it, reach out to a lawyer that specializes in student loan debt. I’m paying on my student loans for a year . Can they still take my taxes.. the take the money out of my pay check.. If they take your money out of your paycheck, it sounds like a garnishment. Are you making payments, or simply seeing your paycheck garnished? If you’re being wage garnished, then yes, they can take your tax refund too. You need to get out of default to stop this: How To Get Out Of Student Loan Default.